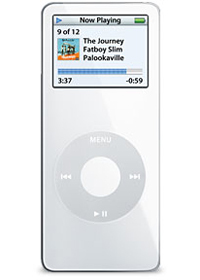 Apple iPod nano is Apple’s fourth digital audio and music player combining features from both the iPod shuffle and iPod, and iPod nano is replacing the popular iPod mini. iPod nano features battery life of up to 14 hours (up to 24 hours on second generation 2G iPod nano models), 1.5 inches (38 mm) 65,536 colors (16-bit color) 176 x 132 pixels LCD screen, measures 1.6 inches (40 mm) wide, 3.5 inches (90 mm) long, 0.27 inches (6.9 mm) thick and weighs 1.5 ounces (42 grams). iPod nano also has stop watch, multiple time zone clock function, combination lock feature and new lyrics screen which modifiable using iTunes. iPod works with iTunes on Mac OS X or Microsoft Windows. ComputerAct!ve (dead link) reviews Apple iPod nano music player and concludes with rating of 5 out of 5 that iPod nano has the same excellent menu navigation as previous iPods, is thinner and with a brighter screen than before. However, users need to have iTunes installed to transfer music, and can’t play downloaded music that’s protected with Windows DRM. Overall, it has he flawless menu system combined with an expansion in storage means that Apple, on the verge of losing its crown at the top of the digital music tree, regains it just in time. MP3 (dead link) reviews Apple iPod Nano (2nd generation) and concludes that 2G Nano doesn’t really bring anything new to the table in the fast-advancing world of MP3 players, but the improvements over the original are certainly welcome. This player is sure to be a top choice among a wide range of users, and it’s a stellar option for first-timers. Just make sure you’re aware that the same $249 for an 8GB Nano will get you a larger but video-capable 30GB iPod.